Abundance is all around us yet many people are oblivious to it so they are never able to attain it. They are unable to manifest abundance and prosperity simply because they are not aware of the law of attraction and how it impacts their lives. The law of attraction states that every positive or negative event that happens with you was attracted by you. To attract abundance you have to be able to attract the right energy to you and around you. You have to know how to attract positivity instead of negativity. Every single one of us possesses the power to attract all of the things we want, as long as we develop the right attitude and the right energy. 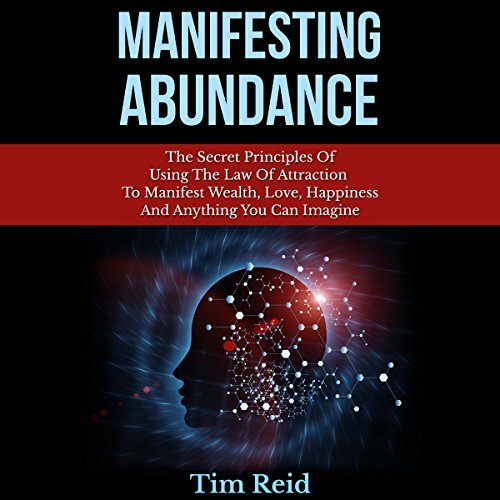 In his audiobook entitled Manifesting Abundance, author Tim Reid reveals the secret principles of the law of attraction and how to use them to manifest wealth, love, happiness, abundance and anything you can imagine! For absolute beginners only, and even then, eh. This book is aimed at someone with zero experience with the LOA; I got absolutely nothing from it. I'd like to say it would be for someone who has never heard of it, but it neither explains what the Universal Law truly is, nor explains how to properly harness is with subconscious emotional programming. It's kind of just a pep talk to consciously think positive, which is actually what the LOA ignores (conscious thought). This is the kind of misinformation that will make someone a non-believer in the Law of Attraction after it fails to work for them. In fact, I feel like I was programmed with negative thoughts from listening to it, because it assumed the listener's life is in the gutter, and kept explaining that your life is terrible and unfulfilled, so you should use LOA. What could Tim Reid have done to make this a more enjoyable book for you? The narration was fine; adequate for the subject. Nothing irritating about it, but nothing to especially draw you into it either.